Sunshine Glamping provides complete, furnished tents, delivered and set up at your event location. Our tents are large enough for 1 queen or 2 single beds. The beds have quality linens, comforters, extra blankets and lots of pillows. The tents also have two end tables, lanterns, bedside rugs and a clothes rack. Imagine the convenience of allowing your guests to sleep onsite at your event, and not have to drive home afterwards! We provide a complete glamping experience for you and your party, including delivery, setup and decoration of our tents, beds, tables, chairs, lanterns, and breakdown after you leave. After your reservation is placed, we deliver our tents to your event location on the date and time you specify, set everything up for you, and break it all down at the end. All you have to do is arrive and enjoy! Our tents are quite spacious, cabin-style, and with plenty of standing room. The screened porch entry is carpeted with 2 chairs, a table, and provides solar lighting. We serve the Mendocino Coast, which we define as a 20 mile radius around Mendocino village in California. We may be able to accommodate cities further out, at an additional cost. Please contact us if you have questions. 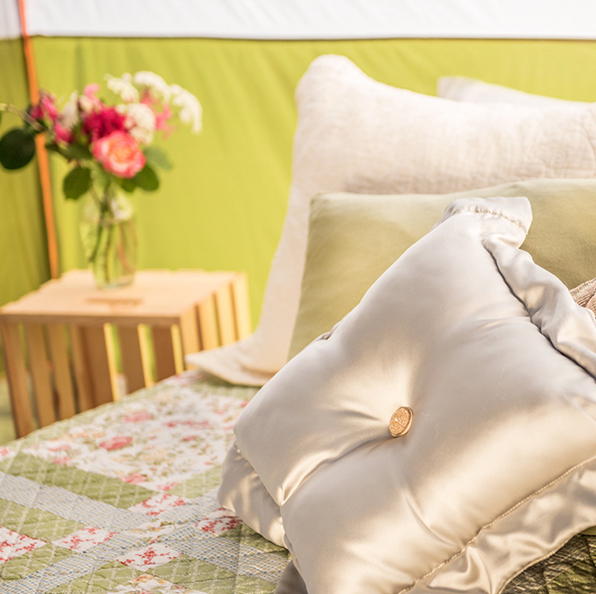 Click here to reserve your glamping experience! Got questions? See our FAQ, or shoot us an e-mail. Copyright © 2016 Sunshine Glamping. All rights reserved.